Serve this with delicious gluten-free Angel Food Cake as a zesty dessert! 1. In a medium saucepan, whisk together sugar and eggs. Sire in orange zest, juice, and butter. Cook over medium heat, whisking constantly for 10 to 12 minutes, or until thickened. 2. Remove from heat. Let cook. 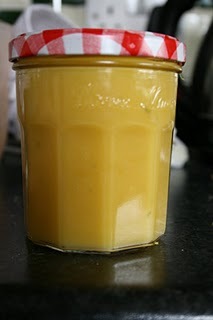 Spoon curd into airtight containers, and store in refrigerator for up to 2 weeks. Holy moly this looks delicious! I’ll make it myself and then get back to you on it! Mmmmm….looks and sounds delicious–can’t wait to make this one!